Whenever we hear the term ‘population,’ the first thing that strikes our mind is a large group of people. In the same way, in statistics population denotes a large group consisting of elements having at least one common feature. The term is often contrasted with the sample, which is nothing but a part of the population that is so selected to represent the entire group. Population represents the entirety of persons, units, objects and anything that is capable of being conceived, having certain properties. On the contrary, the sample is a finite subset of the population, that is chosen by a systematic process, to find out the characteristics of the parent set. 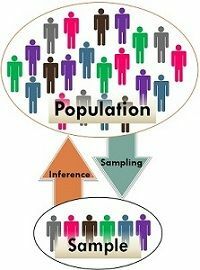 The article presented below describes the differences between population and sample. Meaning Population refers to the collection of all elements possessing common characteristics, that comprises universe. Sample means a subgroup of the members of population chosen for participation in the study. Includes Each and every unit of the group. Only a handful of units of population. Focus on Identifying the characteristics. Making inferences about population. Finite Population: When the number of elements of the population is fixed and thus making it possible to enumerate it in totality, the population is said to be finite. Infinite Population: When the number of units in a population are uncountable, and so it is impossible to observe all the items of the universe, then the population is considered as infinite. Existent Population: The population which comprises of objects that exist in reality is called existent population. Hypothetical Population: Hypothetical or imaginary population is the population which exists hypothetically. The population of all workers working in the sugar factory. The population of motorcycles produced by a particular company. The population of mosquitoes in a town. The population of tax payers in India. By the term sample, we mean a part of population chosen at random for participation in the study. The sample so selected should be such that it represent the population in all its characteristics, and it should be free from bias, so as to produce miniature cross-section, as the sample observations are used to make generalisations about the population. In other words, the respondents selected out of population constitutes a ‘sample’, and the process of selecting respondents is known as ‘sampling.’ The units under study are called sampling units, and the number of units in a sample is called sample size. The collection of all elements possessing common characteristics that comprise universe is known as the population. A subgroup of the members of population chosen for participation in the study is called sample. The population consists of each and every element of the entire group. On the other hand, only a handful of items of the population is included in a sample. The characteristic of population based on all units is called parameter while the measure of sample observation is called statistic. When information is collected from all units of population, the process is known as census or complete enumeration. Conversely, the sample survey is conducted to gather information from the sample using sampling method. With population, the focus is to identify the characteristics of the elements whereas in the case of the sample; the focus is made on making the generalisation about the characteristics of the population, from which the sample came from. In spite of the above differences, it is also true that sample and population are related to each other, i.e. sample is drawn from the population, so without population sample may not exist. Further, the primary objective of the sample is to make statistical inferences about the population, and that too would be as accurate as possible. The greater the size of the sample, the higher is the level of accuracy of generalisation.